What is the measure of a man? Is it his integrity, his level of skill, or impact on the lives of those around him? What if this same man is a criminal? How should society treat this person? And can this individual still have access to facilities and aid a normal man does? In a futuristic, riot-torn Los Angeles where crime is around every corner, even criminals have a second chance and a place to lay low when the going gets tough. First-time director Drew Pearce's “Hotel Artemis” features a diverse, star-studded cast in a crime noir atmosphere where there's never a dull moment. Exploring concepts of redemption, revenge, and retribution, “Hotel Artemis” shows a lot of character and depth in its premise and ideas. However, while it may move at a steady pace and seem action-packed on paper, it's in the story’s execution where we realize this is one hotel you may not be inclined to revisit. Sucked back into the dangerous life he wanted out of, Sherman (Sterling K. Brown) – aka code name: “Waikiki” – takes a job robbing a bank with a team of specialists which includes his own brother, “Honolulu” (Brian Tyree Henry). However, the group fails to open the bank vault and has to steal from bankers and citizens before making an escape, then gets into a firefight with police upon exiting. Sherman’s brother is mortally wounded and needs immediate treatment, and going to a regular hospital is out of the question. Fortunately, there's an alternative: Hotel Artemis, a 13-story, members-only medical facility where criminals can rest and get help. 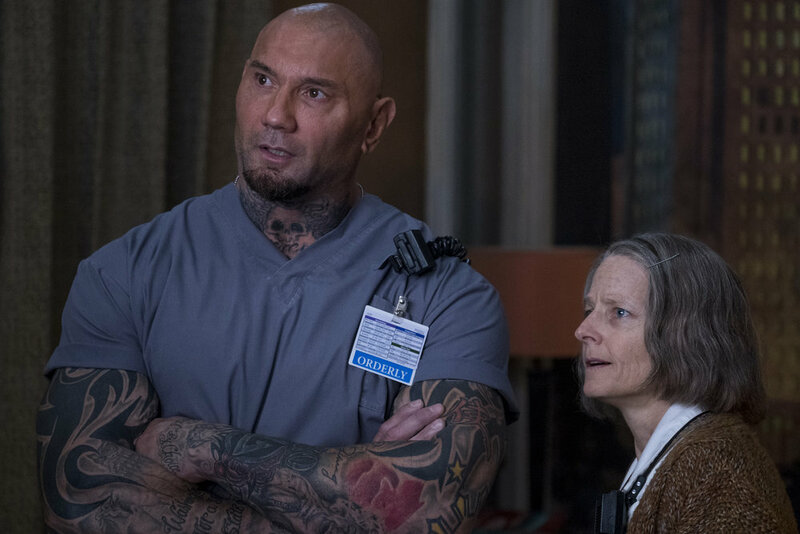 Run by Jean “The Nurse” Thomas (Jodie Foster) and her muscular assistant “Everest,” (Dave Bautista) the Artemis has been in operation for 22 years and has a list of rules that provide order and stability, such as forbidding police from entering and not allowing guests to kill each other on hospital grounds. Moving swiftly to the secret facility with his brother in tow, Sherman finds relief in the well-known comfort of Ms. Thomas and his past associates. But in a place filled with arms dealers, assassins, and crime kingpins, what manner of secrets lie within? What are the motives of its various inhabitants? And most importantly, did Sherman’s botched bank robbery land him in more trouble than he thinks? From the beginning, the movie's tone is dark and brooding, with the dystopian background of a Los Angeles overwhelmed by chaos and destruction. Public unrest and civil disorder are at an all-time high as water and electricity shortages push citizens to blow up buildings and attack riot officers. But amidst the chaos, the Hotel Artemis can be seen in bright neon despite its secret location, as if calling to those looking to escape the chaos outside. In fact, the plot doesn’t stray far from the hotel itself. Being in a central setting like this allows the story to move along at a brisk pace. Much like the 1985 film “Clue,” there's always something going on, whether it's the electricity randomly going out, the nurse running to prevent an incident, or someone getting killed. These occurrences keep the audience engaged and focused on the plot, which is also peppered with a few twists for good measure. Unfortunately, these revelations are simple at best, and don’t offer much information to make the characters or setting truly memorable. This hotel is supposed to be something mythical and legendary to outsiders, but it sure appears to be a pretty sparse environment. The halls are mostly empty, it's quiet most of the time, all of the action takes place on one floor, and there's hardly any sign of life. It feels more like a bed and breakfast than a hotel, but perhaps that was meant to keep with the film's brooding mood. Regardless of Drew Pearce’s intentions, these factors prevent audiences from becoming enmeshed in the plot and walking away with a fresh, modern take on noir. The cast is not only quite remarkable for a debut, it's bursting with talent and diversity, with names like Jeff Goldblum, Jodie Foster, Sterling Brown, Charlie Day, and Zachary Quinto. It's an eclectic group of individuals who give solid performances and entertaining dialogue. There's also a few energetic action sequences that feel straight out of “John Wick.” However, none of the characters are very robust or multi-dimensional. This even goes down to the code names they have in relation to their membership and room assignments in the Artemis (which refer to a member’s personality traits). Charlie Day as “Acapulco,” for example, is an international arms dealer who is only used as comic relief, despite Day trying to be a menacing villain. He is as spastic of a character as in other films he's appeared in, and he fits a particular archetype and motive. The characters are not boring in their activities or interactions, but they nevertheless feel clichéd. Moreover, some talented actors are extremely underutilized and are only present for a few minor scenes at best. And worse yet, there are only a handful of people present at one time, adding to the already empty atmosphere. There is no background cast or extras roaming between levels or in hallways. There's also very little action until “Hotel Artemis” finally wraps up. If you're going to opt for plot developments and dialogue to win audiences over, make sure it's not so boring. On the whole, Drew Pearce’s “Hotel Artemis” is a mixed bag that contains both great and unsatisfactory pieces that ends up being somewhat forgettable. It’s not a horrible film by any means, but I can’t imagine directors continuing the story in a sequel or even a prequel. If the setting only gave off a vibe similar to John Wick’s Continental Hotel (but with more varied assassins), I believe the film could have been something audiences would gladly revisit. Unfortunately, the gloomy nature of “Hotel Artemis” keeps it mired in shadows, and I think people would rather settle for a Holiday Inn instead.